Hearing loss from exposure to loud sound affects millions of people. Noise-induced hearing loss is preventable. And it’s easy to prevent. JBJ Ear-Plugs were developed to provide low cost, one-size-fits-most high fidelity earplugs that can be used in a variety of noisy environments. Earplugs: to reduce noise but preserve sound quality; in effect, to turn down the noise but not muffle voices, environmental sounds, or music. These high-fidelity earplugs are effective or anyone who needs to hear accurately in noise: attendees at concerts, clubs, other loud performance venues; aircraft personnel; construction workers; industrial workers; medical/dental workers; workers in environments with loud music such as concert halls, nightclubs or bars; emergency vehicle personnel; athletes; participants in motor sports; truck drivers. 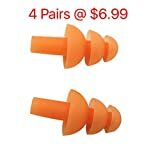 Each purchase includes 4 pairs of high fidelity earplugs, carrying case. Easy to carry in your purse, backpack or pocket. When JBJ Ear Plugs are used correctly, expect approximately 20 dB of sound isolation. G-Biotics Co-Enzyme Q10 (Co Q10) ~ HIGH GRADE 100mg ~ ON SALE NOW!